Begin with your Skin Medspa is now offering a three-tiered approach to skin rejuvenation – resulting in noticeably improved skin tone, texture and tightness. Patients seeking skin rejuvenation can be younger or older, male or female, 'skintelligent' about their treatment options or not. They have different budgets, different expectations-and different problems with their skin. What they typically share, however, is that they have multiple skin issues, reflecting multiple levels of damage. We always begin with handing a patient a mirror and essentially reading the face together. We'll note the various changes, some of which are superficial in nature, some of which have root causes that lie deeper in the dermis. We'll find out what is most bothersome to the patient, and discuss various ways of proceeding. In the process, the patient is often pleasantly surprised that more than one issue can be addressed as part of a non-surgical treatment regimen, particularly with the 3D approach. The 3D approach, using light technology, allows us to take three separate non-ablative procedures that each target different problems (and depths of skin involvement), and use them in various combinations to achieve a full (3D) effect. We are able to develop a treatment plan, tailored to each patient's own needs and desires that optimize the outcome while still incurring no downtime whatsoever. The Photo Genesis procedure (using the Cutera LP 560 'intelligent' pulsed light addresses an array of superficial pigment changes induced by the sun that occur in the epidermis and papillary dermis. Overexposure to UV light can cause brown solar lentigines ('age spots"), sallow ness, generalized redness, and/or specific tiny, diffuse telangiectasia. The Photo Genesis procedure mitigates and even eliminates these bothersome changes, resulting in a more uniform skin color. The Laser Genesis procedure addresses the diffuse textural changes associated with aging skin, which occur primarily in the papillary dermis. The laser energy stimulates dermal collagen re-growth and realignment (remodeling) so that pore size is reduced, cobble-stoning is flattened, and fine lines are obviated. Therefore, a positive impact on the micro topography of the skin can be achieved, in a manner that, until the advent of the Laser Genesis procedure, could not be accomplished nonablatively. The Skin Tightening procedure is an inspired way of treating lax skin. It utilizes laser to heat the water within the dermis to the point of collagen contraction. The collagen fiber support matrix not only tightens immediately, but is reinforced over time with integration of new fibroblasts. The clinical result is skin that not only looks, but feels firmer. Patients do not require anesthesia, and clinical outcomes, are well received by patients opting for a non-surgical approach. Our oldest patient is 94 and loves the way her skin looks. Each of these three modalities (Photo Genesis, Laser Genesis and Skin Tightening) can be used in combination with the others-on different occasions or during the same visit-to create a synergistic effect where the whole is greater than the sum of the parts. For instance, improving both texture and tone, or both tautness and texture, produces an overall effect that belies the non-ablative nature of the procedures. In fact, we often follow Laser Genesis with Photo Genesis during the same visit: patients enjoy the rapid, tangible improvement they see in color, in addition to the more gradual effects of collagen rebuilding. The additive effect may also be attributed to a combined response within the dermis if there is sequential targeting within one treatment session: for instance, the gradual bulk heating of the skin that occurs with a tightening treatment can be "topped off" with Laser Genesis, such that each is optimized. Lastly, by combining multiple procedures within one visit, you can maximize results for the treatment series with a reduced number of visits. If utilizing more than one light modality in the same visit, we start with the deepest-reaching procedure and move toward the most superficial. Thus, Skin Tightening would precede Laser Genesis or Photo Genesis, and Laser Genesis would precede Photo Genesis. In this way, treatment at one level does not inhibit subsequent targeting beneath it. A series of treatments is still scheduled to leverage the results of the prior treatment, and the visits are spaced two weeks apart so the skin can begin healing and remodeling in the interim. Patient Age 30+WITH SUPERFICIAL DYSCHROMIA AND FINE TELANGIECTASIA; ALSO COBBLESTONING, LARGE PORES AND/OR FEATHERY LINE IMPRINTS. Laser Genesis and Photo Genesis are an effective combination in a variety of patients. Both younger patients with large pores and older patients with large pores and/or fine wrinkling will benefit over time from the collagen realignment initiated by Laser Genesis. In addition, those same patients who also present with varying amounts of dyschromia, appreciate the rapid improvement they see with Photo Genesis. AGE 40+ FOR WHOM SKIN LAXITY AND CREPE-PAPER SKIN OR A LACK OF COLLAGE 'CUSHION' ARE THE MOST BOTHERSOME. This scenario represents a situation in which the patient is interested in skin tightening first and foremost and in improving the overall resiliency of his/her skin. Because typically only one to three tightening treatments is necessary, and usually a greater number of Laser Genesis sessions, we can combine them in a manner that not only affords maximum effect but minimal visits for the patient. We maintain a one-month interval between skin tightening treatments, however, to allow establishment of a base of new collagen. This scenario is the same as in Sample Treatment Protocol #1 but has supplemented the 4 visits for Laser Genesis/Photo Genesis with 2 different sessions of Skin Tightening along to address laxity. It is clinically viable to integrate the Skin Tightening into the other visits (preceding the Laser Genesis procedure), and there would still be no downtime. Three procedures, however, would add to the time of the visit. Additional procedures dove-tail nicely with 3D treatments and may be incorporated into the treatment plan. Mesotherapy is helpful if the weight of subcutaneous fat is exacerbating gravity changes and the appearance of skin laxity. If midsize vessels on the face, neck and chest are a detraction, the laser can be utilized immediately prior to any of the 3D modalities. Small amounts of carefully placed Botox are helpful immediately prior to doing Laser Genesis for fine perioral lines or Skin Tightening for brow lift. Microdermabrasion treatments may be given 2-4 times throughout a 3D treatment series, immediately prior to a Laser Genesis or Photo Genesis treatment, to slightly compromise the surface of the skin and enhance penetration of the light. Filler materials, which address the deeper, more discrete wrinkles and creases are typically administered in a separate office visit following Skin Tightening treatments, so as to minimize the possibility of increasing the rate at which the substance is metabolized due to a thermal effect. While skin rejuvenation procedures are becoming increasingly familiar to patients and potential patients, 3D is a distinctive approach we can offer. With 3D, we are starting with non-ablative procedures that are appealing in-and-of themselves-by virtue of the skin problems they address (tone, texture and tautness) and the relative ease with which they are addressed (no surgery, anesthesia, or downtime). By combining them, though, in an artful and scientific way, we are able to achieve a visual impact that is actually greater than the sum of the parts-and hugely satisfying to our patients. After 6 treatments I watch myself getting younger. It continues after the treatments stop! Even my neck looks less dry and aged. Thank you for your ad announcing your service that is innovative and safe. This laser collagen enhancer is a wonderful discovery! After my first treatment, I noticed such a remarkable difference. I've never felt comfortable in a medical office, but Begin with your Skin Medspa 's atmosphere and staff made me feel pampered and at ease. Thanks for everything! What treatments are used in 3D Skin Rejuvenation? The 3D approach with Cutera light technology allows us to take three separate non-ablative procedures that each target different problems (and depths of skin involvement), and use them in various combinations to achieve a full (3D) effect. We are able to develop a treatment plan, tailored to each patient's own needs and desires that optimize the outcome while still incurring no downtime whatsoever. 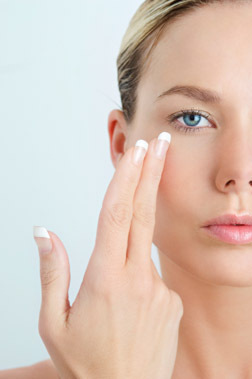 How does the 3D Skin Rejuvenation work? Over time, alterations in the color and texture of the skin inevitably occur, due to cumulative sun exposure (hence the term 'photo aging'). In addition, the collagen in the skin that keeps it taut begins to weaken, and with the pull of gravity the skin becomes lax. The Cutera 3D concept addresses each of these three types of changes. Each of the three modalities (Photo Genesis, Laser Genesis, Skin Tighten) can be used in combination with the others-on different occasions or during the same visit-to create a synergistic effect where the whole is greater than the sum of the parts. 4-6 treatment sessions are typical. Are there any side effects to these treatments? Mild erythema and some darkening of pigmented lesions are the only bothersome side effects that resolve in 24 to 48 hours. Who is a good candidate for 3D skin therapy? Anyone seeking skin rejuvenation; younger or older, male or female, anyone who is 'skintelligent' about their treatment options, patients with different budgets, different expectations-and different problems with their skin. Who is not a candidate for 3D skin therapy? We always begin with handing a patient a mirror and essentially reading the face together. We'll note the various changes, some of which are superficial in nature, some of which have root causes that lie deeper in the dermis. Some components of 3D therapy will not help individuals with severely leathery or "stretched-out" tissues -it tightens skin. Can other procedures dove-tail with 3D treatments? Submental liposuction or Mesotherapy, BOTOX, Microdermabrasion and filler materials can add to patient satisfaction.